JUST click the RETWEET “square arrow” button! I’ve found some people use the older method of quote retweets or RT retweets. It is becoming increasingly difficult to find each of those individual retweets. So from here on out, any other or older method, like quote retweets or RT retweets, will NOT be included in the running for the sketch prize. ONLY “retweet button” clicks are eligible for the sketch prize. The contest runs from the first day of the convention weekend to the day after the convention. Any rewteets of any sketches after the winner has been announced are not valid for the sketch prize. I’ve been doing my Sketch Retweet Contest on my Twitter feed during my convention appearances for two years now. It’s my way of bringing a bit of the convention to you. The response to these “contests” has been great! And growing! Each batch of convention sketches gets more and more retweets. Some of you discovered my work through one of my contests. I appreciate the support from new and long-time fans alike. Thank you for faithfully retweeting my sketches to your Twitter followers during each of my conventions. I hope y’all are having as much fun as I do during the convention weekend. Over the past few conventions and the growing number of sketch retweets, I’m finding certain Twitter parameters makes tracking each retweet more and more challenging. So in an effort to make sure everyone continues to get a fair shot at the original sketch prize I am instituting that new rule posted at the beginning. I’m at C2E2 in Chicago, IL this weekend. The contest runs Friday, April 25 to Monday April 28th when the winner will be announced. 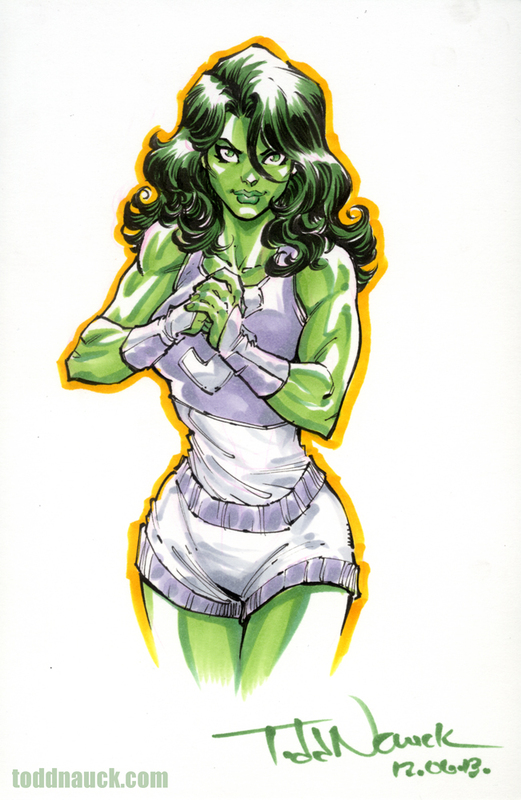 This entry was posted in Appearances and tagged c2e2, sketch retweet contest by Todd Nauck. Bookmark the permalink.